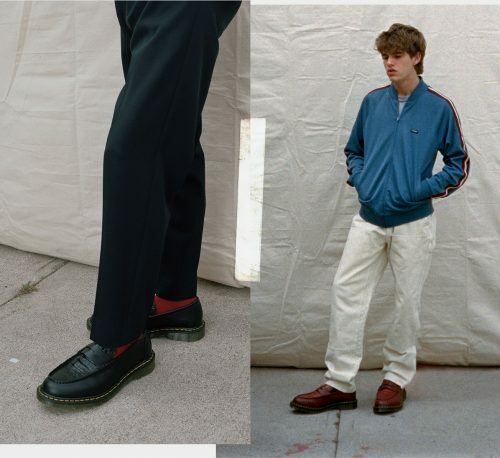 Dr. Martens has collaborated with Californian brand Stüssy to create an exclusive four-piece capsule collection. Remixing a classic Dr. Martens style – the Penton Loafer is crafted from premium materials to create a DM’s x Stüssy culture-collide that fuses surf sensibilities and independent style. The Penton Loafer arrives in four new colour ways – green, black, white and red. Smooth leather and a faux crocodile material are used to craft the luxe upper. Yellow welt stitch threading appears on the top of the midsole adding a classic Dr. Martens detail. An Airwair sole completes the low-top shoes. You can score a pair via Dr. Martens UK site. They ship within UK for FREE for orders above £50, so remember to sign up with us to gain access to our UK warehouse.